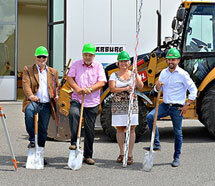 Injection moulding machine maker Arburg has started construction work on a new extension in Brno, Czech Republic, to significantly enlarge the existing Arburg building by 565 sq m to more than 1,600 sq m. The new capacity is mainly required to meet the continuously increasing demand for customer-specific production cells. The successful expansion of this sector has meant that there is no longer enough space in the existing building for constructing and testing complex systems. Thus, in 2013, it was decided to extend the building originally erected in Brno in 2004. The ATC is equipped to extremely high specifications and currently covers 1,050 sq m of usable space, 300 sq m of which is taken up by the demonstration room. This provides space for up to six Allrounder injection moulding machines, which will be available for evaluating moulds, application tests and practical training purposes. In addition, there is a spare parts store. The expansion of the ATC in Brno is an important milestone in the success story of the Arburg subsidiary, which is responsible for both the Czech and Slovakian markets and was formed in 1996.